A small coffee table I’ve recently finished. 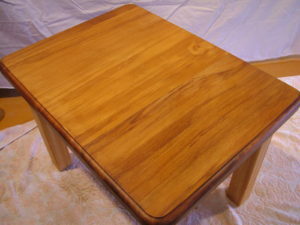 The top is made from recycled rimu heartwood, the legs and rails from new macrocarpa. 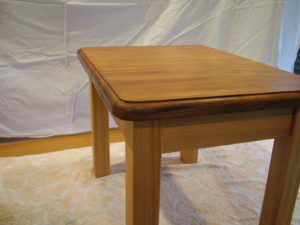 Finished in Pure Tung Oil, and polished with paste wax. The legs and rails are hand-cut mortice and tenon joints. The top was hand-jointed and hand-planed flat, followed by a lot of sanding. Dimensions: 520mm high, 420mm long, 370mm high. It was designed to fit into a corner between two sofas and to be just below the height of the sofa arm-rests. 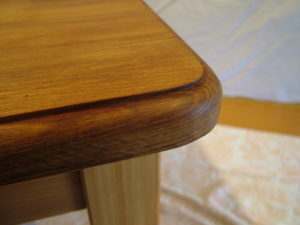 The pure tung oil really brings out the rich grain and colour from the NZ rimu, and is easy to apply and work with. The only down-side of this finish is that each coat takes between 4 days and a week to properly set when it’s mid-winter in New Zealand. I left it for two weeks to fully cure before applying the wax finishing coat.